The aneurysm is a swelling of the artery wall, the rupture of which leads to haemorrhage, with a risk of mortality. It can involve different organs such as the kidneys, the heart or the brain. Aneurysm is characterized by a hernia in the wall of an artery, reflecting the weakening of it. Aneurysms can remain silent or break, causing serious health problems or even death. An aneurysm can occur in important arteries such as those that supply blood to the brain and aorta. Aneurysm can also occur in the peripheral arteries – usually behind the knee – although the rupture of these is relatively rare. In the artery that directly leaves the heart: it is an aortic aneurysm. It includes the aneurysm of the thoracic aorta and the aneurysm of the abdominal aorta . In the artery that irrigates the brain: it is a cerebral aneurysm, often called intracranial aneurysm. 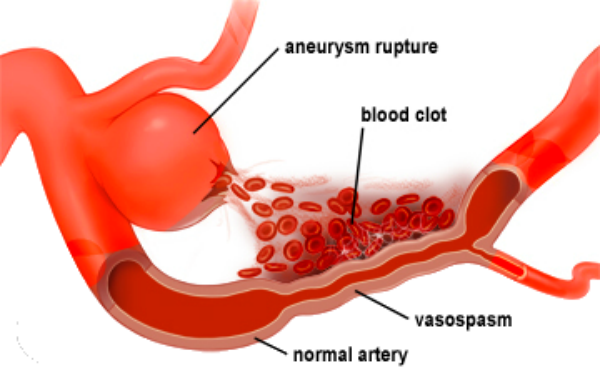 There are other types of aneurysms such as those affecting the mesenteric artery (affecting the artery that supplies the intestine) and those affecting the splenic artery and occurring in the spleen. Regarding the cerebral aneurysm, the latter may cause a leak or rupture of blood, causing bleeding in the brain: it is called hemorrhagic stroke . Most often a cerebral aneurysm following a rupture of a vessel occurs in the space between the brain and the tissues (meninges) covering the brain. 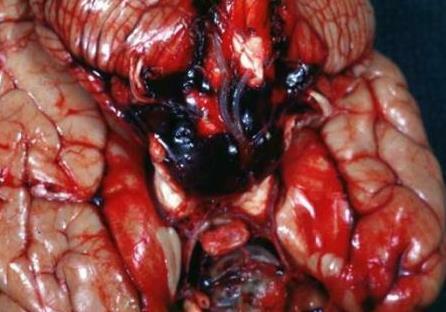 This type of hemorrhagic stroke is called subarachnoid hemorrhage. Most cerebral aneurysms, however, do not rupture. Brain aneurysms are more common in adults than in children and more common in women than in men. Swelling in an artery occurs as a result of thinning of the wall, allowing the blood pressure to abnormally widen the arterial wall. An aortic aneurysm usually takes the form of a bulge that is uniform all around the artery, whereas the cerebral aneurysm is reflected rather by the formation of a bulge that takes the shape of a sac, usually at a where the arteries are the most fragile. Brain aneurysms with rupture are the most common cause of a type of stroke, known as subarachnoid hemorrhage. This type of stroke is less common than ischemic stroke. It is not completely understood why the arterial wall weakens and as it does to cause an aneurysm. It is known, however, that a number of risk factors are known to be associated with the development of aneurysms. If you have a sudden or severe headache or other symptoms that may be related to an aneurysm, you will have a test or series of tests to determine if you have bleeding in the space between your brain and the surrounding tissue (hemorrhage subarachnoid) or a form of stroke. If bleeding has occurred, the emergency team will determine if an aneurysm is the cause. If you have symptoms of a cerebral aneurysm without rupture – for example, with pain behind the eye, vision problems and paralysis on one side of the face – you will likely experience the same tests. Computerized tomography (CT). This scanner is usually the first test used to determine if there is bleeding in the brain. Magnetic resonance imaging (MRI). An MRI uses a magnetic field and radio waves to create detailed images of the brain. It assesses the arteries in detail can identify the site of the aneurysm. Cerebrospinal fluid test. Subarachnoid hemorrhage often leads to the presence of red blood cells in the cerebrospinal fluid (fluid surrounding the brain and spine). This test is performed if there are symptoms of aneurysm. Cerebral angiography or angioscanner . During this procedure, the doctor injects a dye into a catheter located in a large artery – usually in the groin. This test is more invasive than others and is generally used when other diagnostic tests do not provide enough information. The use of imaging tests to detect unruptured cerebral aneurysms is generally not recommended unless the patient has a family history with a first-degree relative (parent, sibling). The majority of people living with aneurysms do not suffer complications. The management of risk factors is important, however. Venous thromboembolism: obstruction of a vein by a blood clot can cause pain in an organ such as the abdomen or the brain, and can cause a stroke in the latter case. Severe thoracic and / or lumbar pains: they occur following a silent or rupture aortic aneurysm. Angina pectoris : Certain types of aneurysm can lead to angina pectoris, a pain related to narrowed arteries that poorly feed the heart. When a cerebral aneurysm breaks, the bleeding usually lasts only a few seconds. Bleeding can cause damage to surrounding brain cells (neurons). It also increases the pressure inside the skull. If the pressure becomes too high, the blood and oxygen supply to the brain can be disrupted to the point that loss of consciousness or even death can occur. Another bleeding. A ruptured aneurysm may bleed again, causing further damage to the brain cells. Vasospasm. Following an aneurysm, the blood vessels of the brain can shrink suddenly and transiently: this is vasospasm. This abnormality can limit blood flow to brain cells, causing an ischemic stroke and cause additional damage to the neurons. Hydrocephalus. When aneurysm rupture causes bleeding in the space between the brain and the surrounding tissue (subarachnoid hemorrhage), the blood can block the flow of fluid (called cerebrospinal fluid) surrounding the brain and spinal cord . This condition can lead to an excess of cerebrospinal fluid that increases the pressure on the brain and can damage tissue: it is hydrocephalus. Hyponatremia. Subarachnoid hemorrhage following a cerebral aneurysm can disrupt the balance of sodium in the blood. This can produce damage in the hypothalamus, an area at the base of the brain. A lower sodium levels in the blood (called hyponatremia) can lead to swelling of neurons and permanent damage. A sudden and severe headache is the key symptom of aneurysm rupture. This headache is often described as the “worst headache” ever known. Headache sudden and extremely severe. Pain above and behind an eye. Change of vision or double vision. Numbness, weakness or paralysis on one side of the face. If an aneurysm does not rupture, it can contribute to the formation of blood clots that will clog smaller blood vessels, possibly resulting in an ischemic stroke. Abdominal aneurysms are sometimes associated with abdominal or lumbar pain. Similarly, thoracic aneurysms can cause symptoms by affecting nerves such as the vagus nerve and other blood vessels, which can cause chest or back pain and symptoms such as coughing, or difficulty breathing or swallowing. The symptoms may also be related to the cause of the aneurysm rather than to the aneurysm itself. In case of infection or vasculitis (inflammation of the blood vessels) for example, there may be fever, discomfort or loss of weight. Here are some risk factors for cerebral aneurysm. Some of these risk factors develop over time. Others are present at birth. Hardening of the arteries (arteriosclerosis). Abuse of illicit substances, especially cocaine. Decreased estrogen levels after menopause. Hereditary connective tissue disorders that weaken blood vessels (eg, Ehlers-Danlos syndrome). A polycystic kidney disease, an inherited disorder that usually increases blood pressure. An abnormally narrow aorta (coarctation of the aorta), which prevents a good supply of oxygen-rich blood from the heart to the body. 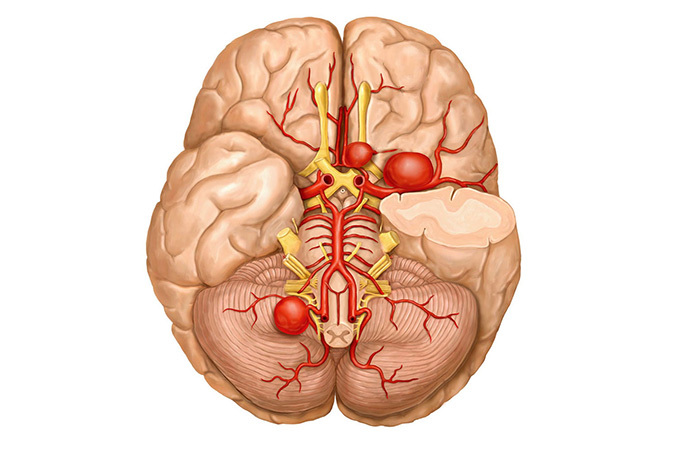 An arteriovenous malformation in the brain, which results in a poor connection between the arteries and veins of the brain, causing an interruption in the flow of blood between the two. A family history of cerebral aneurysms, especially in a first degree relative (parent, sibling). How to prevent aneurysm rupture? Smokers should quit using appropriate strategies or treatment programs. Indeed, it is well accepted that smoking can be a risk factor for the formation, growth and rupture of aneurysm. Studies have shown that persisting smoking induces an increased risk of relapse. Avoid sudden, vigorous, sustained efforts such as lifting heavy weights as this can cause a sudden increase in blood pressure. Limit caffeine intake. Caffeine is indeed a stimulant that can cause a sudden increase in blood pressure. Eat a healthy diet and exercise regularly at moderate intensity. All cases of aneurysm without rupture require active treatment, but when the aneurysm breaks, emergency surgery is required. Regarding the aortic aneurysm, whether abdominal or thoracic, it requires emergency surgery when there is rupture. Without immediate intervention, a ruptured aneurysm is always fatal in the thoracic aorta and almost always fatal in the abdominal aorta. The decision to operate an unruptured aneurysm in the aorta depends on a number of factors related to the patient’s state of health, age, and characteristics of the aneurysm itself (size and speed of development). To operate aneurysm of the aorta, there are two operative techniques that will be chosen according to the severity and location of the aneurysm. It requires removing the aneurysm after clamping (using a forceps) of the artery. The circulation in the aorta is interrupted and the part of the damaged artery will be replaced by a prosthesis. It is a minimally invasive procedure of inserting a plastic tube (catheter) into an artery, usually into the groin, and then driving a platinum wire through the catheter to the aneurysm site. The wire wraps around the aneurysm, disrupts blood flow and causes blood clotting. Endovascular surgery is usually preferred over traditional surgery, especially because the operating time and hospital stay are shorter. However, endovascular surgery has risks, in addition to those usually encountered during surgery. Aneurysms that are less likely to rupture are not surgically treated because of the potential risk of brain damage resulting from possible surgical complications. Patients are then counseled on how to monitor and, if possible, modify the factors that increase the risk of rupture of a cerebral aneurysm. This includes the control of blood pressure. Indeed, if the person is treated for high blood pressure, treatment with an antihypertensive would reduce the risk of rupture. When a cerebral aneurysm with rupture results in subarachnoid hemorrhage, the patient will be admitted to hospital urgently and undergo brain surgery to close the disrupted artery, to prevent further bleeding. There are medications available to relieve symptoms and manage complications. Analgesics, such as acetaminophen can be used to treat headaches. 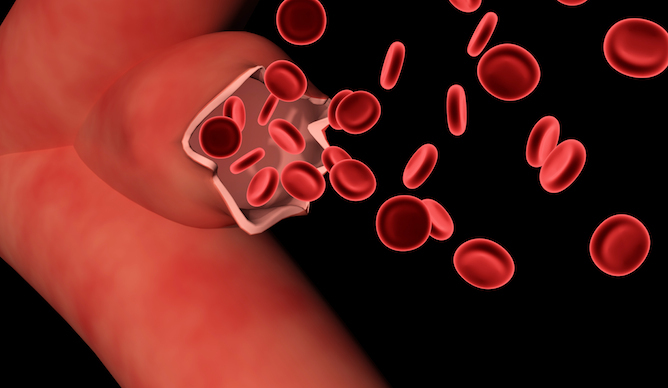 Calcium channel blockers prevent calcium from entering cells in the walls of blood vessels. These medications may decrease the narrowing of the blood vessels (vasospasm) which may be a complication of an aneurysm. One of these drugs, nimodipine, appears to reduce the risk of brain injury caused by insufficient blood flow following subarachnoid hemorrhage. Anti-convulsive medications can be used to treat seizures related to aneurysm. These drugs include levetiracetam, phenytoin, and valproic acid. Rehabilitation therapy. Damage to the brain from subarachnoid hemorrhage may result in the need for rehabilitation of physical skills, speech and occupational therapy.